1. Mix the maida, baking powder, butter, salt and sugar in a bowl. 2. Mix well and gently add water. 3. Knead to a pliable dough and cover it with cling film. 4. Place it in the fridge for an hour. 5. To make the filling, heat a pan of water and bring to a boil. 6. Add the chicken pieces and boil for 10 minutes. 8. Boil and mash the potatoes. 9. Mix this with the chicken and keep aside. 11. Saute the garlic until lightly browned. 12. Saute the onions until translucent. 13. Add the garlic, onion, raisins, butter, parsley, salt and pepper powder to the chicken mixture. 14. Mix well and keep aside to cool. 15. Remove the dough from the fridge and pinch small golf size balls. 16. Flatten them using a rolling pin on a lightly floured surface. 17. Place 1 tblsp of the filling in the center and fold to form a half-moon shape. 18. Seal the edges and continue the same with the rest of the ingredients. 19. Transfer the empanadas to a lightly greased baking tray. 20. Brush the top with the egg. 21. Bake in a preheated oven at 375F/190C for 30 minutes or until lightly browned. 23. Serve warm or at room temperature. 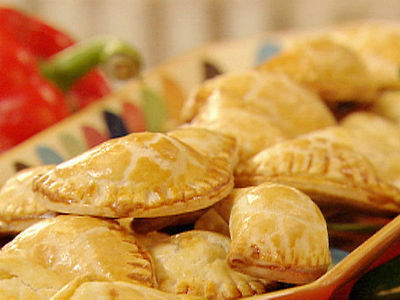 Feel free to comment or share your thoughts on this Chicken Empanadas Recipe from Awesome Cuisine.